We have two HRB specials for Halloween this Thursday. Tony Dee returns for a Halloween themed special show at 6am, and then in the evening Sarah Beattie plays more Haloween themed music. Listen out for the likes of "You Can Do Magic", "Witch Doctor", "Unchained Melody" from Ghost and even the theme to Rentaghost. 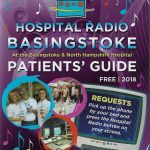 It's Haloween on your hospital radio!